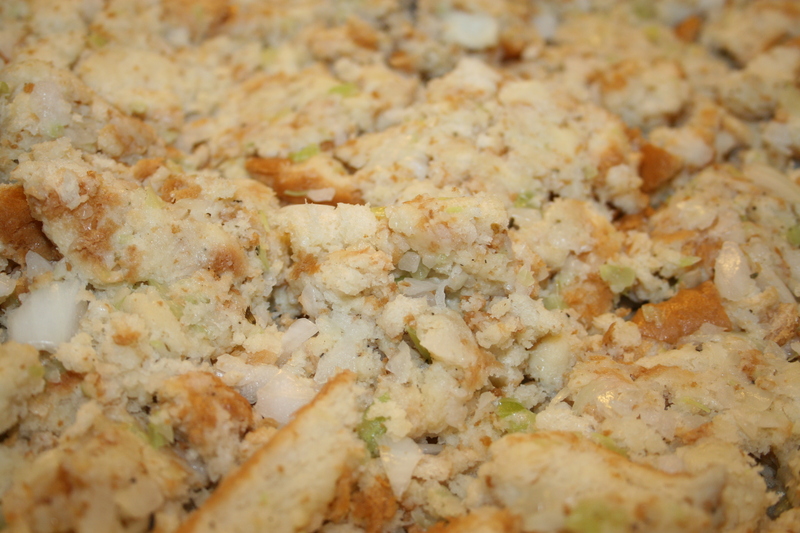 Homemade bread stuffing is my favorite part of our family’s Thanksgiving. My go-to recipe is the Bread Stuffing recipe in the Betty Crocker cookbook. Sadly, the directions stop before the actual baking occurs because Betty Crocker’s recipe is designed to be stuffed inside the turkey and cooked. I always make the stuffing as a side and not inside the bird. So here’s the Betty Crocker recipe with a few adjustments. 2. Melt butter in a large stock pot. Add in onion and celery. Cook an additional 5 minutes. 3. Turn off heat and add bread cubes. 4. Using your hands, mix the bread with the butter/vegetable mixture until completely incorporated. 5. Pour bread mixture into baking dish. Add broth and mix well. Bake for 30 minutes.